(a). Middle Pillar is an exercise in visualization. Visualization is important as a means of communication with the subconscious, to influence the process of self-transformation. (b). Reproduced scientific evidence, (Marks, 1975), indicates a mutual-reinforcement between certain specific vibrated vowel-sounds and visualization experiences. This constitutes a visual-auditory synesthesia or feedback system. Vowels evoke powerful visual "sensations." (c). This paper shows how Middle Pillar Exercise corresponds with several forms of self-induced synesthesia, or sensory blending. A reason is shown for retraining our eyes and ears out of habitual modes of sensory screening. With this tool, we might free ourselves from certain conceptual restraints and upgrade our practice of Middle Pillar Exercise. This is a technique which heals our culturally pre-programmed Cartesian duality, the mind-body split. Synesthesia is defined as sensory blending or melding; any combination of the five senses may be involved simultaneously. The most common combinations are between visual-images and sound (colored-hearing), and visual-images produced by taste. The sense of smell, in perfumes, for example, evokes memory and its attendant images. Alpha-numeric color synesthesia may have led to specific color attributions to the Hebrew letters (even though these attributions vary widely). In synesthesia, ordinary stimuli elicit extraordinary conscious experiences. For example, standard black digits may elicit highly specific color experiences and specific tastes may elicit unusual tactile sensations. Imagine that every time you hear a particular sound or view an ordinary black digit, you experience an accompanying perception of a highly specific color. The stimulus and elicited experience can occur in the same modality--printed digits or letters can trigger colors called photisms. Or, conversely, cross modal translation leads to taste eliciting tactile experience, or sounds eliciting colors. Experiments show that for any given synesthete there is high consistency of the pairing between eliciting stimuli and the synesthetic experiences over time. We can take advantage of this tendency in our magickal practice, and train ourselves toward these automatic sensory associations. For example, we can learn to associated, not only the color, but the musical notes of each of the alpha-numer letter/paths of the Tree of Life. Synesthetes often claim that their synesthetic experiences occur independent of their intentions, suggesting the processes underlying the phenomenon may be automatic. onto the stimulus. The binding of form and synesthetic color can be extended throughout the qabalistic correspondence system. Research shows that synesthetic color may be activated outside of awareness, or conscious intent. It is precisely this type of coupling we are trying to achieve. There are also conceptually driven synesthetic experiences, without externally presented stimuli. This implies even in purely astral magical work, the automaticness we ingrain through the correspondences should meld classical qabalistic associations together to create a gestalt or the atmosphere of our ritual. In early training, an externally introduced stimuli may be necessary -- this is the purpose of the magickal armamentum of weaponry and appurtences. They help elicit the associated synesthetic experiences. There is a common core of similarities in synesthetic experiences. Visual colors are associated with speech sounds. There is evidence that everyone is capable of experiencing synesthesia. Synesthesia may occur spontaneously, or as a learned response. Middle Pillar Exercise, with its simultaneous 'vibration of God-names' and visualizations, may be viewed as an 'access code.' This 'access code' is a helpful tool which opens creative relationships with different parts of the subconscious and the physical body (parasympathetic system). When we are "caught up" in the meditative process, we experience cognitive meaning in sensory form. Psi information (24) is mediated via mental imagery. The image and its "meaning" are identical. Therefore, psi communications are enhanced under conditions which facilitate imagery. Both Magickal visualizations and creative imagination promote this viewpoint. According to Archetypal Psychology, synesthesia is how imagination imagines. What this experience does is transform the singleness of any one sense out of its literalness. It makes a metaphor of sense perception itself, for example, "I can see music." One of synesthesia's special roles is to summarize important cognitive distinctions in a convenient and economical way. As a shorthand, it is compact but relatively fixed and, therefore, limited. Its validity as a useful tool appears to be limited to the context of magickal practice. Without a system for creating a meaningful experience, such as pathworking, there is very little spiritual value in the phenomenon except the aesthetic. Researchers have considered synesthesia less significant in adulthood than childhood. This need not be true with proper application, such as the Middle Pillar Exercise. Proper control of the breath has been emphasized in both western and eastern meditation techniques. This, of course, connects with the sense of smell, and posits us in the realm of Psyche (the breath-soul of the head whose passages are the nostrils). Psyche's realm is "the place between", the realm of soul-making. It is that place between the physical body and the abstractions of the spirit. Note the semantic similarity between 'psi' and 'Psyche.' In QBL, this internal space is called Tiphareth, realm of imagination. Middle Pillar is designed so that the actual formation of the body/mind system may be changed and renewed. It is not concerned with the exclusive cultivation of either the body or consciousness. Regardie states: "Always in a salutary way is the path between the two extremes indicated." The vibration of god-names, as well as stimulating the vision in specific directions, stimulates the endocrine system and glands in the mid-brain by a resonance effect. These effects are not necessarily to be viewed as causal (the result of previous action), but are perceived simultaneously; their reciprocal relationship is inherent. We may presume to use current scientific research to upgrade our practice of Middle Pillar. Through the inherent mutual reinforcement phenomena of visual-auditory systems, when we Middle Pillar, we induce synesthesia at will. The next obvious question is: why would we want to induce synesthesia? When one is experiencing the creative imagination, that engagement with an image, all modes of perception meld into indivisible unity. This form of systematic cross modal matching is closely allied with the concept of a system of correspondences. Significance is not found in analysis, but in the image itself. (25) The image consists of such apparently diverse elements as behavior, fantasy, thoughts, dreams, illness, etc. None of these are 'because of' the image, they are the image itself as a 'just-so' story. To form a "ground" for our spirituality in the imaginal realm (internal topography) we must re-imagine the Creation. pillar, which stands at the center of the world." This pillar is a useful symbol for what we shall term the ego-Self axis. This axis is a relationship built up through various psychological exercises. It forms the link between ego-consciousness and one's Holy Guardian Angel. in sensory form. In this experience, careful aesthetic elaboration of a psychic event is its meaning. One can learn to experience this mode of consciousness in a ritual situation. Once (re-)learned, it can extend into every sensory experience of daily life, either literal or metaphorical. The sense of inherent meaningful importance in day-to-day events and trivia is a necessary concern of soul. Through it 'life makes sense', and 'sense makes life'. The alchemists always stressed identity of the physical/spiritual connection. The roots for the word 'sense' mean something which is directly tangible (physical and solid or concrete). It also now implies something meaningful and significant. Imagination takes place wherever we are. When you split sensory data from meaning, you not only split sensation from intuition, you also split spirit, soul, and body. The conjunction of concrete sensation, psychic image, and spiritual meaning is aisthesis, which denotes breathing in (smelling) and perceiving. In ritual, all the senses are directly involved via the correspondence system. This creates a mood or atmosphere which the participant "breathes in." There is an experience of unity of the senses via synesthetic metaphor. 1. Vowels are an especially powerful source for production of secondary visual sensations. 2. There is a correlation between auditory pitch and visual brightness; brightness of vowels vary and photisms (visual images of light) produced vary in brightness as the sounds that produce them vary in their frequency. 3. Visual pitch predicts the whiteness or blackness of associated photisms. 4. Visual size increases as auditory pitch decreases; the louder the vowel-sound, the larger the image. However, induced size is not related solely to pitch. Order of increasing frequency (pitches): u, o, a, e, i. Order if increasing vowel brightness: u, ou, o, a, e, i. Example: The God-name, IAO, begins with a bright vowel and concludes with a dark vowel. The center vowel may be considered the melding point or median. The above information indicates that one might be able to learn to pitch the magickal voice and loudness to induce a desired visual effect. This eliminates any sense of detachment from one's experience or activity. This is an experience of the immortal body, or philosopher's stone. In the realm of sacred space, its most striking manifestation is religious man's will to take his stand at the very heart of the real, at the center of the World, that is, exactly where the cosmos came into existence and began to spread out toward the four horizons, and where, there is possibility of communication with the gods, where he is closest to the gods. Every religious man places himself at the Center of the World and by the same token at the very source of absolute reality, as close as possible to the opening that ensures him communication with the gods. The creation of the world becomes the archetype of every human gesture, whatever its plane of reference may be. Every construction or fabrication has the cosmogony as paradigmatic model. Techniques of orientation, or aligning oneself to the directions, are designed for the construction of sacred space. The more closely a ritual reproduces the work of the creator gods, the more effective it is in producing the appropriate results. The model for the creation of sacred space begins from a center and projects horizons in the four cardinal directions: East-West, North-South. This model has been followed throughout history when settling new territory or in the founding of cities. Any individual resides at the center of his/her own existence. This quadrated circle sets up the conditions necessary for us to enter into the sacred time/space of the archetypes. We may contact the gods through the medium of the sacred pole or cosmic pillar. The Middle Pillar Exercise is a particularized form of this sacred connection. Sacred time appears under the paradoxical aspect of circular time, reversible and recoverable, a sort of mythical eternal present that is periodically reintegrated by means of rites. (c). Communication with heaven is expressed by variants of the Cosmic Pillar, which stands erect at the Center of the World. This Pillar is a useful symbol for the Ego-Self Axis, or the connection between the conscious and subconscious principles of existence. Forming the link between ego-consciousness and the Self, it represents both aspects of the soul working together in harmony. It is known in Magick as the Knowledge and Conversation of the Holy Guardian Angel. What men do on their own initiative, without a mythical model, belongs to the sphere of the profane; hence, it is a vain and illusory activity, in the last analysis, unreal. The more religious a man is, the more paradigmatic models he possesses to guide his attitudes and actions. With this in mind, we may examine how the Banishing Ritual produces an effective orientation and transformation in the psyche of the aspirant. 1). Construct a circle. In order to "ground" our imagery of the surrounding circle, it is necessary to have a physical model in the beginning of magickal practice. Hammer a spike into the dirt. Extend a string from it which is used for a radius, and inscribe a circle in the dirt. If you have no suitable place which is private enough, purchase two 4'x8' masonite panels and paint a portable model on your floor. Walk around in the circle to get a "feel" for your working area. By placing your body in the circle, you will get a feeling for your special spot, then later this circle is internalized. Visualization will allow you to set up your circle at will, once its lineaments are firmly in mind. In alchemy, this sacred area was created through a process known as circumambulatio. It promotes focus or concentration on the center. An indirect approach to the center was provided through circumambulatio. In setting off the circumference of your magical circle, you enact this primary deed. It prepares the mind for the influx of archetypal energies. The circle is a receptive, feminine symbol. For a brief exercise, dance slowly into the center, proceeding with a spiral motion. 2). Return to the center of the circle. Imagine a stream of white light flowing into your body from above. This scintillating rod of light penetrating the body, is the masculine force of the spirit. It traverses the planes of existence from spirit to matter. It transforms and connects instinct to archetype. The light may be visualized as extending from a point above the head, widening into a cone shape which is widest at the feet. 3). Perform the Qabalistic Cross (facing East). This affirms the basic structure of The Tree of Life, interpenetrating the physical body, and ordering processes. 1. Touch the forehead, say ATOH (Thou art). 2. Bring the hand down toward the feet, saying MALKUTH. 3. Touching the left shoulder, say VE-GEDULAH. 4. Touching the right shoulder, VE-GEVURAH. 5. Crossing the hands over the breast, say LE-OLAHM. This is repeated when closing the circle at the end of your rite. These rituals begin by quadrating the circle. One form (Golden Dawn) proceeds to the right, turning clockwise E. - S. - W. - N. The other, (Aurum Solis) moves to the left to clear the area, and then to the right to invoke the angels. Since it is traditional that a widdershins movement (leftward or counterclockwise) is a banishing movement, and clockwise motion invokes forces, this detail of the A..S.. ritual seems preferred. The quadrated circle symbolizes the wholeness of four elements united in the center. This sets up a field with two polarities, synthesized in a central unifying principle. Four is the minimum number of divisions of a circle which represents wholeness. 4. integrability, which indicates a digestible amount of experience of cosmic consciousness. A unique moment of perfection emerges from the latent continuum. The intervention of this ordering principle promotes realization in consciousness of the underlying unity in creation. The stable, cohesive nature of the boundary of the circle is represented by its division into 4 parts. 'Four' is the number which represents the soul. 'One' represents God, or God-Realization. Giordano Bruno, 16th Century alchemist, defined magic as "that which unites the soul with God through love." So, this basic orientation ritual is a graphic representation of the unification of material and spiritual realms through mutual interpenetration. The aspirant is the nexus point of the operation where these principles are commingled. Spirit is manifested, and matter ennobled. The soul is protected from disintegrative influence and reconstituted positively, using right action and visualization. This timeless world is conducive to synchronistic or parapsychological phenomena. This doesn't mean miraculous manifestations of desires or ego-control fantasies. This realm operates on determined patterns of probability. Its proper use is for meditation which leads the personality toward inner concentration and unification. NO MAGIC SHOULD EVER BE PERFORMED OUTSIDE OF A CONSECRATED CIRCLE. Anthropologists have noted that ritual and play cannot be separated in primitive civilizations. They interpenetrate and overlap one another. Rituals and games are alike in that both require complete sincerity and complete detachment from wishes and desires. To avoid the trap of "cheating", one has to be passionately involved, but sacrifice any personalistic desire. This reflects a basic religious attitude. Rituals and games need fixed rules and certain specific images to govern their proper unfolding, but they are not completely rigid. A certain amount of playful personal freedom is inherent in the unique artistic execution of a rite or game. Do not conduct your ritual mechanistically; an error in form is more excusable than a faulty approach or attitude. Try to cultivate and maintain a joyous, playful orientation. Magick is called the Great Work, because what "works" is that which has the power to transform...not because it is conducted in a spirit of disciplined drudgery. To my mind, the exercise described as the Middle Pillar is the groundwork of all actual developmental work. It is a process which is the basis of Magic. That this has been but seldom realized is obviously at the root of the futile attempts to do Ceremonial and perform Ritual, of which the general public hears every now and again. Even students of Magic of many years standing have been guilty of negligence in this respect, and also in failing to recommend it to their successors. The circuit of the Tree of Life represents All possible experiences of human existence. The spheres represent modes of being, while paths are transitional phases between them. The Middle Pillar Exercise circulates the consciousness of the aspirant around all these aspects. The practice of its visualization begins activating only the spheres of the Middle Pillar, in line with the vertical axis of the body. Later, when some proficiency has been acquired, the spheres of the side pillars are added. We then have the entire diagram of the Tree interpenetrating, and ordering all planes from physical to spiritual. This is a fairly profound image produced with a minimum of graphic elements. pattern is reinforced, the easier it will become for you to create this state. Eventually, the aspirant could perform the exercise in the most distracting of situations without loss of concentration. The goal of Middle Pillar Exercise is the eventual formation of the Philosopher's Stone, or Diamond Body. Many phases of transformation are necessary to work toward this task. One of the operations necessary for the production of the stone is the alchemical circulatio, or circulation of consciousness around the aspects of being. This circulation of the light (consciousness) unites diverse centers. This circulation of one's true, creative, formative energies produces a sense of joy and intoxication, as if one had been freshly bathed. It opens up the reality of an inner world, which serves to break the soul's dependence on the phenomenal world. enlightenment a permanent condition. The light must be visualized as permeating the body, not only inside or outside. While the light means clarity, perception and enlightenment of understanding, as you circulate it around your body, there should be a perceptible physical sensation, as well. Once you begin your meditation, there should be no interruptions; end and beginning are one. To be effective at all, the confirmation in the light should last for a minimum of 15 minutes. Circulatio, or circulation of the light, combines the alchemical operations of sublimatio and coagulatio. Sublimation means generally to have an ennobling effect, and coagulation means to solidify. During circulatio, one sublimates body and coagulates spirit. Circulation around the aspects of being leads to an equilibrium where one is contained within the opposites. Spirit penetrates soul, and soul envelops spirit. When spirit and soul unite, thoughts are immobilized. The soul "crystallizes" and spirit becomes an effective influence in the personality. This is real-I-zation of the Diamond Body, or Self. The phenomena which used to be experienced as (external or internal light) is now perceived as psychic revelation. This balancing is a delicate process. It must be performed by the right person at the right time. Sublimatio consists of spirit and soul ascending and descending from lower to higher, and higher to lower, in the imaginal realm. Through it, the spirit hidden in matter becomes visible. Sublimatio is the alchemical form of resurrection. Sublimatio is a vertical, solar activity. Coagulatio is feminine, or lunar in quality. Excess quantities of either of these potencies may have destructive effects. This is the value of a balancing ritual. The solar-libido, which is creative and life-promoting, may be experienced as scorching dryness or fiery anger. The lunar-libido also has negative forms, which are literal "bring downs." These modes of psychic energy have a wide range of powerful effects on human experience. Through disciplined use of a balancing ritual, the solar-principle provides an increase in understanding and an expanded field of awareness. The Stone's lunar portion materializes elusive intuitions and spiritual potential. One submits willingly to the transpersonal totality of psyche. This marriage produces the Philosopher's Stone through circulation. Sublimatio is the vertical, Middle path and corresponds with the element Air. In QBL, Shekinah is the Middle Pillar. She meditates the ascents and descents of the soul and spirit. Through her, the ten spheres of the Tree of Life slowly sublimate into Kether, the Crown (Primordial Air). The "ascents and descents" of the soul are characterized in ancient lore as Angels. An example of this imagery is the story of Jacob's Ladder. 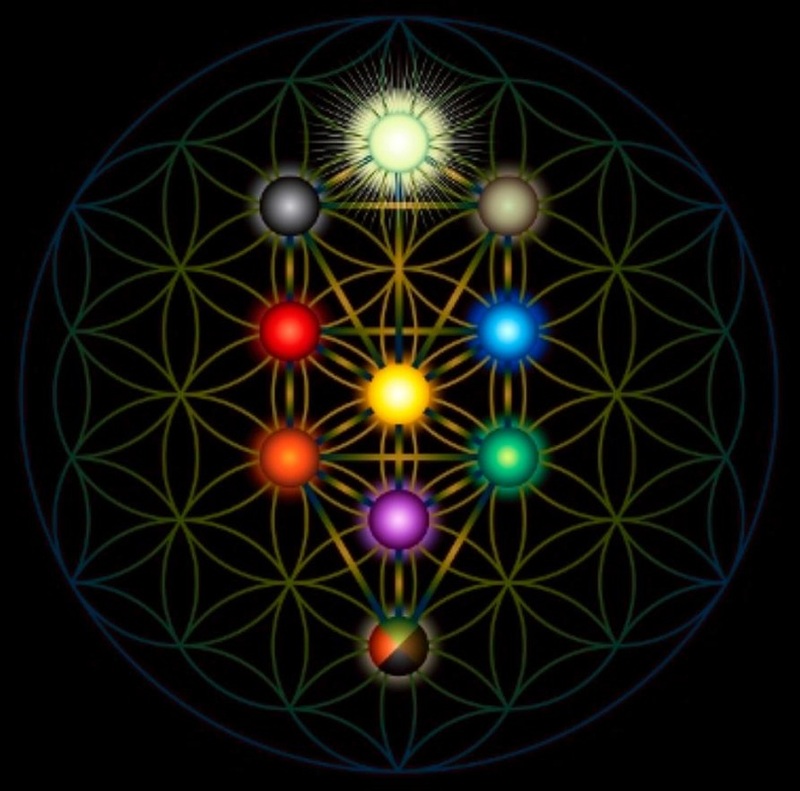 The Supernal Triad (top 3 spheres of the Tree of Life) represents the three aspects of knowledge: the Crown, Wisdom (the Knower), and Understanding (that which is known). In Kether, the Crown, all opposites reside in total union. It reconciles oppositions which are distributed throughout the other spheres. One may be redeemed through this self-knowledge. But there is great danger in direct revelation of the archetypal psyche. The danger lies in calling up the pure archetype, which ego-consciousness is never able to assimilate or integrate. Therefore, never invoke Spheres, but always use Pathworking. If one succumbs to the disintegrative effect, the personality is annihilated in the Abyss of the transcendent imagination. This is the psychological equivalent of drowning. The alternative is release from the personal ego attitude toward active participation within the archetypal dimension. Behavior does not become archetypal. It already is, if only you care to notice. Dreams, Active Imagination, and the practice of Ceremonial Magick may be seen as forms of coagulatio. In the process of circulatio, there is a resurrection of the Soul of Body. Images are an expedient mode of access to the knowledge of the soul, as it circulates rhythmically throughout every cell of the body. The body becomes subtle and spirit gains body. One is able to maintain daily functions in the ordinary world without losing intimate contact with the archetypal dimension. In fact, this connectedness to daily life is essential to balance soul-travel in the archetypal realms. Maintain ordinary pursuits except during the allotted meditation period. This indirect penetration to the core-of-being produces fulfillment. One may use conscious, purposeful action to intentionally produce experience of unconscious non-action which is purposeless. This is a natural preparation for death, the experience of awareness without the constraints of time/space. The dynamic activity associated with ego-conscious (the desire to know, to penetrate and illumine) culminates in a cessation of effort. The rational process of controlling imagination defers to another power. This experience of silence and tranquility is known as Shekinah, or Sophia, Divine Wisdom. This means there is an emptying of the personal attachments of the ego. Man then experiences a timeless incarnation of the universal aspect of being. The alchemical process described through this circular thinking is imaginatio. This indicates an abstraction from concentration and active fantasy. Its negentropic effects are a product of the Self. "Free-energy" enters the field of time when it leaves the archetypal world. In sublimatio-coagulatio, something new is created, and negentropic potential becomes available. This is commonly described to have a cleansing, or healing effect. Through sublimation, the spirit hidden in matter becomes visible. "Primitive thinking" or anima consciousness (a diffuse awareness of potentials), is more suited to maintaining opposites in harmony while this ordering process continues along mythical patterns. It might be thought of as an archetypal ordering process, a "Way." When disorder is not ordered by archetypal processes, it falls to the ego. A middle path between "primitive thinking" and directed, goal-oriented (ego) thought points to the type of sublimation which Jung speaks of in Aion. The ego system has a linear form of segmented, irreversible time implanted as a result of the directed thinking and historical development of the self. A relationship between the ego and the self is possible through the transcendent function. This is not built up with directed thinking, but with circular thinking, the negentropic source: imagination. Middle Pillar Exercise provides a fail-safe, balanced form of participation in the realm of imagination, which is central to psychology, alchemy, magick, and physics. If, for some reason, you dislike using Hebrew God-names, correspond the qualities of these spheres with god-names from another Pantheon. It is best, however, to pick a pantheon and stick with it, for consistency. Visualize a brilliant ball of white light above your head. The ball is to be about 1 1/2 to 2 ft. in diameter, just above the head. As you visualize, chant "EH-HE-YEH" three times, quite slowly. If you do it correctly, you resonate within your own body, causing physiological and psychological changes. Next, imagine a rod of light descending through your head to your throat. It changes colors there and becomes pale lavender. The ball of light is visualized as the same size, only the color changes. Chant "YE-HOH-VOH E-LOH-HEEM three times. The ball then travels down to the center of the chest. The color changes to gold. Chant "YE-HOH-VOH E-LOAH-VA-DA-ATH", three times, slowly. Once a concurrent visualization of the centers is obtained, and the sequence of chants finished, the ball travels back up through the body to the head. From the head a stream of energy goes down the left arm, left leg, the entire left side of the body, coming back to the head via the right side of the body. This energy then travels down the from of your body, coming back to the head via the right side of the body. This energy then travels down the front of your body, through the feet, and comes back up to the head via the spine. At that point, it becomes a fountain, spewing forth multicolored light, after spiraling up from the feet a third time. When the energy is moving downward, you should exhale; when it is moving back towards the head, moving upward, you should inhale. When the ball is at your feet, in the beginning of the exercise, it may be expanded to include the entire sphere of the earth, as the god-form is literally The Lord of the Earth. The visualized colors, and vibratory nature of the chanted god-names, turn on the endocrine system. The harmonization of right brain and left brain functions is symbolized in the harmonious blending of the circulation. Frequent (once daily, minimum) practice of the middle pillar, doing the visualizations and doing the chants, will create an energy reservoir which balances the personality, promotes growth, initiates repair or healing, and builds a reserve for times of stress. It forms the basis of a firm foundation for further experiments in self-transformation. Middle Pillar Exercise provides a fail-safe, balanced form of participation in the realm of imagination, or the psyche. A practice of this type, whether a psychological exercise or a magical rite is central to psychology, alchemy, magick, and physics. It forges a conscious link with our Source, and a road or means of communication for consciousness to travel along--it is a Way. Through it we come to know and understand our inner guiding principle and work toward realizing our Divinity. Tiphareth represents our inner guiding principle, but Kether is our sainthood, or Mastership. The Middle Pillar links up the various up the various aspects of our Being from Body-consciousness, to Ego-consciousness, to Self-Realization, mystical experience, and Perfection. The gulf between our animalistic nature and our incarnation of Divinity in the Master-soul is symbolically expressed by the vertical column of Middle Pillar. THE MIDDLE PILLAR EXERCISE may be corresponded with Tiphareth, since it seeks to align us with the higher Self. The establishment of a conscious dialogue between the ego and the Self is the goal of both Jungian Psychology and High Magick. We can consciously work toward this goal. Its psychological aspect deals with establishing an "ego-Self axis" or line of communication. Likewise, in Magick the same vertical connection between the mundane and transcendent is sought. This seeking is active and a procedure has been established to realize the goal. The procedure is a visualization exercise wherein we build the Tree of Life within our physical, astral, causal, and divine Selves. 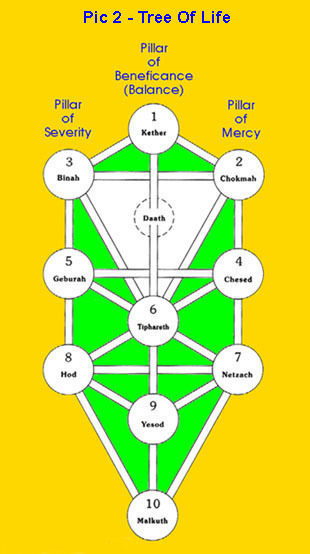 Middle Pillar Exercise concerns spheres known as #1 Kether; Daath; #6 Tiphareth; #9 Yesod; and #10 Malkuth. (see diagram, next page.) The ancient philosophers who developed this system created a symbolic means of depicting how to gain control over your emotions enough to remain poised in detachment from the dual pull of the opposites. This develops within you a new faculty for discrimination and spiritual discernment. The mind moves from the superficial to the depths wherein lie creativity and meaning. "The Secret of Wisdom can be discerned only from the place of balanced power, "--that is between the two outer pillars, along the Middle Pillar where all transformations of consciousness occur! This is freedom from emotional compulsion, and yields equanimity. This central point between the two symbolic pillars of the opposites, the place of balanced power from which the working is correctly viewed, is the implication of DAATH, the shadowy Sphere. Doing Middle Pillar, you magically create the sphere DAATH as an imaginal gateway to mystical experience--another dimension of experience. It is a new factor of adaptation or equilibrium, not a given within the basic scheme. It is the result of actively seeking, then experiencing, the transpersonal Divine through grace. It is this new factor of adjustment which is known variously as the Golden Flower, Rosy Cross, Philosopher's Stone, Diamond Body, etc. and is linked with Tiphareth as the seat of conscious awareness of the higher Self. Kether refers to our latent God-Realization of sainthood; Daath is a symbolic link, self-induced and self-devised, between the Divine Genius and the ego. Tiphareth is Self-Realization; Yesod is ordinary emotional consciousness; Malkuth, body awareness. they symbolize your heights and depths. Middle Pillar brings in a charge of spiritual force, which is realized in consciousness. It brings Godhead into incarnation. THE MIDDLE PILLAR Middle Pillar consists of several phases: First the preliminary establishment of rhythmic breathing. Second, the formulation of the five centers through vibrating the God Names. And third, circulation of the Divine force throughout the psychic system. After months of practice you can extend the scope of your effort by adding the spheres of the two side columns as well. Remember, while vibrating the Divine Name of each sphere to contemplate in full consciousness on the implications of the sphere, i.e. its spiritualqualities and its relation to your own divine consciousness. Also, DAATH, as the link between your ego and Sainthood is very important. At Tiphareth, we realize the Self and can take up an I-Thou dialogue with it. Yet, we don't merge with the Self, or God, or become perfected until Kether, when the final traces of duality are annihilated--therefore the ego is annihilated or transcended. You become a timeless incarnation of the universal aspect of Being. METHOD: Stand upright, hands to side, eyes closed, breathing rhythmically and deeply. Wait until the mind is calm, quiet, and still. Transfer your attention to the region immediately above the crown of your head, and visualize a great sphere of brilliant white radiant Light. When the visualization is obtained, regard it with a sense of devotion since it is the vital core of your Being, the living spark of Divinity. It is pure Light and power. Vibrate three of four times EHEIEH (Eh-hay-yeh), which means "I AM" or "I WILL BE." Steadfast in the contemplation of this Divine Source of power and enlightenment, endeavor to feel an all-penetrant beam of brilliance which is travelling downward toward your throat or nape of neck. Light becomes a lavender-blue sphere as you vibrate Ye-hoh-voh Eh-loh-heem, repeatedly. A quite indescribable sense of poise and mental quiescence should be experienced. The brilliant beam then descends to the heart or region of solar plexus, and from there a warmth and a quite different sense of powerful love will gently radiate from within like an interior sun. Vibrate the Name, Ye-hoh-voh El-oah ve-Da-ath, several times. It is felt within the interior of the body, at its very heart. As you pass from contemplation of the heart to the generative organs, they will become stimulated or "turned on." Visualize the bright violet sphere and vibrate Shah-dai El-Chai. After arousing this center, the beam of Light passes downwards to the feet; this negative pole of Middle Pillar automatically appeared when Kether was formulated, but now we concentrate here on the olive drab or jet black sphere, and vibrate Ah-doh-nai ha-Ah-retz. We have brought down light into the personality, even the body. Now circulation of the Light becomes necessary. Having been awakened from latency into some degree of activity, it is necessary that the power the centers generate should be circulated throughout the invisible or psychic system, or nervous disorders and psychic disturbance could result. Circulation distributes the power and relieves the pressure of over-stimulation. With everyone of the five centers active and throwing power into the mind and body, and clear awareness of middle pillar, another technique becomes necessary. RETURN TO CONTEMPLATION OF KETHER. Imagining this center still radiating, will it to circulate through your system. It descends from the head towards the left shoulder. Passing through the entire length of the left side of the body, the magnetic current strikes the soul of the left foot. Then it passes over the right sole, upwards through the leg and thigh and body to the right shoulder, eventually returning to Kether. Second, This time imagine the current of spiritual power descending from Kether in a forward direction, downward in front of the face, neck, chest, thighs and feet. It turns backward along the soles, calves, ascends the spinal column, and neck until it reaches Kether. Repeat both steps several times, breathing rhythmically. To "wrap up" the circulation phase of the exercise, we imagine spiralling Light surrounds our body. Contemplate on Kether and imagine the upright column of brilliance, corresponding to Middle Pillar; Pass now to the visualization of Malkuth emanating its inherent power of stability and equilibrium and fertility. Spiral Light up from the soul of your feet, as if wrapping yourself like a mummy. The spirals of Light gradually ascend the body, while you feel a distinct sensation of a whirling of spiritual powers rising from feet to thighs, up the trunk, swathing you in pure white Light, until, the current rests in Kether, where it shoots out the crown of the head in a fountain effect. This prepares you by stilling the mind for meditation. Close with Banishing and Cross. (1) Miller, R.A., Webb, B., Dickson, D.: "A Holographic Concept of Reality,"
PSYCHOENERGETIC SYSTEMS, S. Krippner,ed.,pp231-237, Gordon and Breach Science Publisher, Inc., N.Y., c1979. (2) Professor David Finkelstein, in a lecture at Yeshiva University. (3) THE DIAMOND BODY: A Modern Alchemical View of the Philosopher's Stone, Philo Stone, c1981 (online). (4) Such as vortices or "twistor space". (6) Edward F. Edinger, Ego and Archetype, Penguin Books, Maryland, 1972, p104. (8) June Singer, Boundaries of the Soul, Doubleday, N.Y., 1972, p172. (9) June Singer, Boundaries of the Soul, Doubleday, N.Y., 1972, p210. (10) Edward Edinger, Ego and Archetype, Penguin, Maryland, 1972, p.235. (11) James Hillman, Loose Ends, Spring Pub., Dallas, 1975, p184-5. (12) Mitchell Walker, "The Double: An Archetypal Configuration", Spring 1976, Spring Pub., Dallas, 1976, p169. (13) Rafael Lopez-Pedraza, "The Tale of Dryops and the Birth of Pan: An Archetypal and Psychotherapeutic Approach to Eros Between Men", Spring 1976, Spring Pub., Dallas, 1976, p179. (14) Otto Rank, Beyond Psychology, Dover, New York, 1941, "The Double as Immortal Self" p62-101. (15) Jung and Kerenyi, Essays on a Science of Mythology. (16) Marie Louise Von Franz, Alchemical Active Imagination, Spring Pub., Dallas, 1979. (17) Robert Grinnell, "Alchemy and Analytical Psychology", Methods of Treatment in Analytical Psychology, Spring Pub., Dallas, 1980. (18) Lyn Cowan, "On Masochism," Spring 1979, Spring Pub., Dallas, 1979, p47. (20) Israel Regardie, The Middle Pillar, Llewellyn, Minn., p79-107. (21) Denning and Phillips, The Magickal Philosophy, Llewllyn, Minn. p257-262. (22) C.G. Jung, "Flying Saucers: A Modern Myth," Civilization in Transition, C.W.,Vol. X, P. 774. (23) Edward Edinger, Ego and Archetype, Baltimore, Penguin Books, 1973. (24) Psi information is that matrix of experience which depends from the intensity of the conscious experience and its duration. (25) "...into the pit called Because, and then he shall perish with the dogs of Reason." Liber Al vel Legis, 2:27, Crowley. This might be read as an exhortation to develop quantum thought-models, rather than remain in the 19th Century, causal or mechanistic mode.